Good morning everyone. I hope you all enjoyed the (Canadian) Thanksgiving holiday! Now that the holiday is over and I’m back to work at Banting House National Historic Site of Canada, one project looms above all others: the new exhibit. We’re very excited to be creating a new exhibit to be unveiled for World Diabetes Day. While I don’t want to give too much away yet, I can tell you that the new exhibit will complement this year’s Blue Monument Challenge and Canadian Diabetes Association campaigns. It’s going to be visually striking and it will feature stories and beautiful images both from Canada and from around the world. If you want to know more, come and visit us when we unveil the exhibit on November 14th. 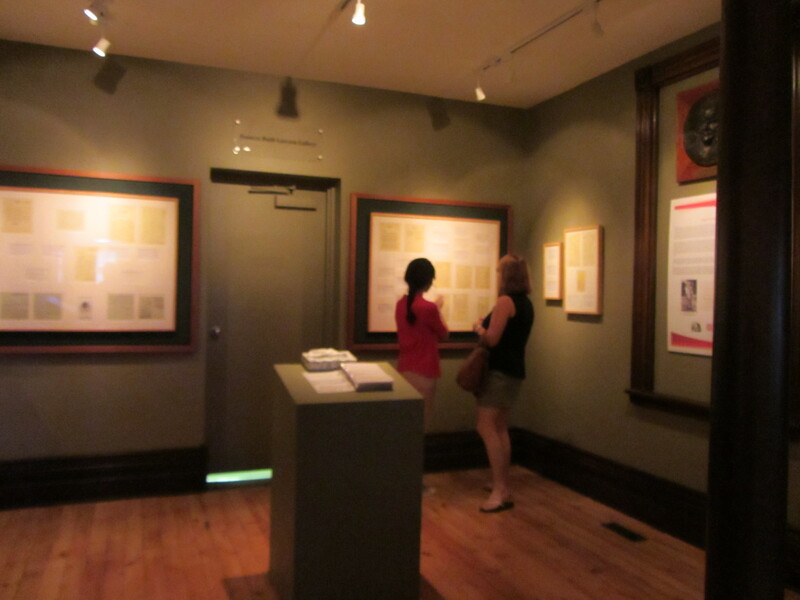 The Frances Ruth Lawson gallery, currently housing the “Dear Dr. Banting” exhibit. This is the space we will use for our new exhibit. Working with Grant on the exhibit design has been a lot of fun. We started off with research and brainstorming. What should the subject of the exhibit be? How much text do we need, and how many images? What layout makes the best use of the space in our gallery? How big should the panels be? Should they be oriented horizontally, or vertically? These are the kinds of questions we tried to answer last week. The more time we spent on it, the more ideas we came up with – so there was a lot of running back and forth between offices and saying “Have you thought about doing it this way?” On Thursday, I spent my afternoon creating mock panels for the exhibit. These small-scale mock-ups help us visualize how the exhibit will look, and they have helped us pitch our ideas to others. Over the course of the week we were able to develop the exhibit from a vague concept to a real plan, and I have to say, I think it’s going to look fantastic. This week we are taking some of the first steps to transform our plan into a reality. We are going to make our final decisions about which stories to include (there are too many to feature all of them in our exhibit), and we are going to write the text that will be displayed on each panel. We will then send this text off to be translated so our panels will be readable in both English and French. We will also decide exactly which images will be included. After that, we need to actually get the panels made – hopefully with the help of someone with a background in graphic design – remove the old exhibit, and install the new one. We will also be working hard to organize the World Diabetes Day unveiling event. So now I know a lot more about how museum exhibits begin. They seem like a great way for a historian to unleash some creativity. I’m excited to be part of a project that will be fun and engaging for the general public. I hope you will visit us on November 14th to see what we’ve been working on! Posted in Behind the Scenes at Banting House.Tagged Dear Dr. Banting, Event, Events, Exhibit, Exhibits, London, Museums, Sir Frederick G. Banting Square, World Diabetes Day.